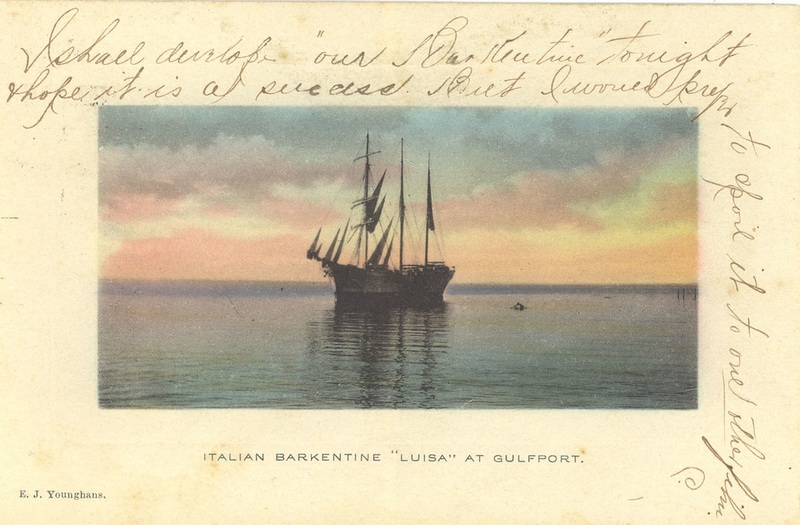 The Albertype Co., 1887-1952, was the publishing company that made postcards for E. J. Younghans to sell in his hardware store in Gulfport in the early 1900s. The Wittemann brothers had worked as printers and publishers in Brooklyn, New York since 1867. In 1890 with the rise in popularity of the post card they started printing postcards under the Albertype name. The Albertype process, invented by Austrian photographer Joseph Albert, used a collotype coating on glass plates permitting high speed mass production of photographs for the first time. Photographs were sent to Germany where they were reproduced as collotypes and printed, but as printing technology improved they eventually set up their own print shops in the United States. They would send photographers as agents to make the photographs, and they accepted photographs taken by individuals as well. E. J. Younghans was one of those individuals who hired photographers and sent the photos to the Albertype Co. to be made into postcards, or ‘views’ as they were called back then. The post cards were printed in black and white, hand colored with watercolor, toned paper, duotones, tinted monochromes, and sepia. The Albertype Co. became a major publisher for other publishing companies until 1952 when they were purchased by Art Vue Post Card Co.